The neckline, whether a deep V, strapless, one shoulder, or boatneck style will likely be the deciding factor on wearing hair in an updo or down. For example, if you’re going strapless, you may want to keep your mid-length hair styled around your shoulders. However, a seam of pretty pearlescent buttons down the back of a gown calls for hair to be pulled up and away, to give the dress details attention. Any stand-out embellishments, especially around the neckline and shoulders will help make the up-or-down decision final. 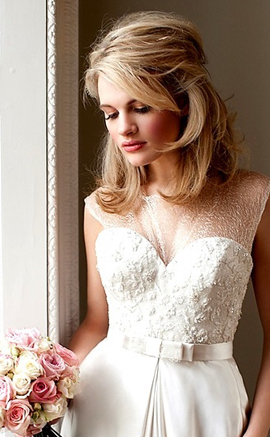 Once you’ve studied the neckline and details of your dress, pinpoint it’s style. Is it classic, with smooth lines, and wouldn’t be out of place in a scene of Breakfast at Tiffany’s, or perhaps it’s more romantic, with lace detailing and a Jane Austin’s Emma vibe. A sleek, 30’s inspired sheath could be considered modern, meaning all else is pared down, and a vintage style could create the option of a simple floral crown. Considering the style of your dress will help you finalize a hair style that enhances your overall look. Though beware of getting carried away with a theme; you want to look pretty and perfect – not as if you’re wearing a costume. You may already have chosen earrings, or are heart struck on wearing your mom’s veil from her wedding. Any accessories you choose will come with needs of their own. A veil will warrant a ‘do that can handle removing it after the ceremony and pictures. 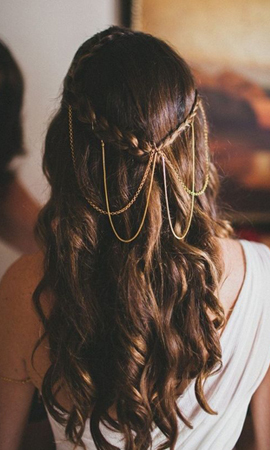 A floral crown or headpiece might call for waves or loose curls. Make sure to consider the hairstyle you are working with now, and what changes your hair will have gone through by the time of the wedding? If you’re looking at a date within the next 6 months, it is likely that your hair will be quite similar, unless you plan a big colour change, cut or extensions. Talk to your stylist about the looks that you like, and how they can work with your hair style and texture to last all day long. Be weary of doing something drastic before the big day, you don’t want to look like a stranger in your pictures. Remember, to book a consultation a few months before the big day at Hair Republic, bringing with you any jewellery or accessories (such as veils or head accessories), images of your dress, and pictures of makeup you like. Your stylist will be able to offer suggestions and together you can plan a beautiful look for your special day.